KOLE – A sister of the former president Apollo Milton Obote has appealed to government for financial assistance. The 80-year-old Hellen Adongo Wontanga, who lives in Bungabunga village, Abeli parish in Akalo Sub-county, Kole District, is asking government to build for her a decent house and give her some money for upkeep. She said she is helpless and currently staying in a dilapidated house. “Sometimes I stay without eating since there is nobody who is looking after me. It is very hard for me to find what to eat since I no longer have the energy to dig, so I am appealing to government to help me,” she said on Tuesday. Obote’s other sister Maliam Apenyu, who was born in Akokoro, Apac District, died of natural causes aged 96 years in 2016. She was buried at her home at the British Corner village, Boroboro parish in Adekokwok Sub-county. The colourful ceremony was attended by over 2,000 mourners drawn from different parts of the country and abroad. Apenyu was Obote’s older sister. The third of nine children, Obote was born in Apac district in northern Uganda. Because his father, a farmer, was a minor chieftain of the Lango tribe, Obote believed himself destined to become a leader. 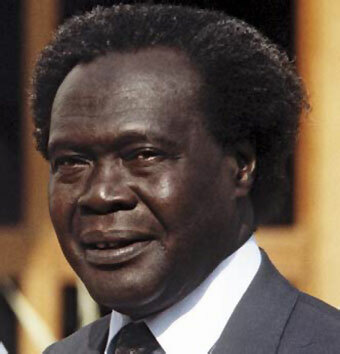 A leader in the movement for Ugandan independence in the 1960s, Apollo Milton Obote presided over the withdrawal of the British colonial government in 1962 and became the country’s first prime minister and later, its first president. Despite bold moves to improve Uganda’s economy and modernize the country, Obote was not able to resolve tribal conflicts that threatened Ugandan unity, and in 1971 he was deposed in a coup led by Idi Amin.